Are you fond of keeping a garden in your backyard? You must be taking care of every plant and tree in your garden. But, do you check whether the soil is in its best condition to provide nutrients to plant or not? 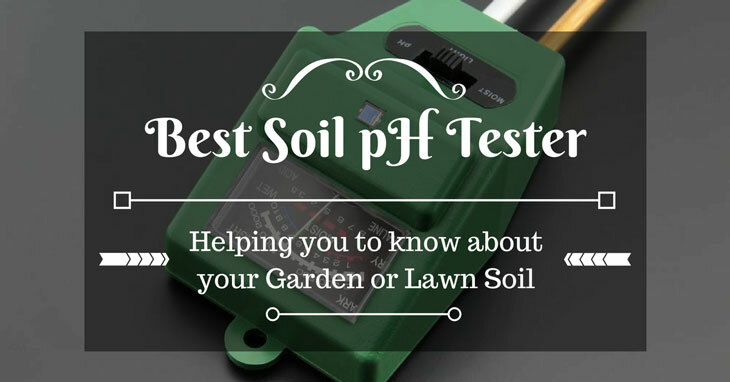 Here, we are going to guide you to select the best soil pH tester so you can maintain its state. What Is A Soil PH Tester? When Should You Be Testing Soil? 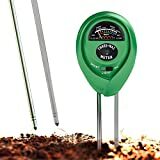 How To Use A Soil pH Tester? To understand what a soil pH tester is, you first need to know what pH is. You must be aware that every item consists of some kind of acidity. Similar is the case with soil. It contains acidity which varies from time to time. One must keep checking the acidity of the soil if they want to have healthy plants in their garden. Now that you know what pH is, understanding a soil pH tester has become easier. 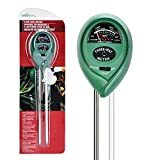 A soil pH tester is a device which is used to test the acidity and alkalinity of the ground in your garden. Chemical colored dyes: There are colored dyes which are to be put in soil water. Customers will be provided with a color chart through which they will have to find out the pH level. pH test strips: pH strips are an authentic way to determine the pH level because it contains a broad range of colors spots. pH test strips are said to be expensive in comparison to chemical colored dyes. Electronic pH meter: We all know that electronic devices are more accurate than any other method regarding anything. Similarly, electronic pH meters are authentic. They are supposed to be put in soil water to determine the pH level of the soil. Knowing what a soil pH tester can do was easy. With understanding all the essential details, you should also find out when you should be using a soil pH tester. The right time to use a soil pH tester is before planting a new seed. It is because every seed needs a separate pH level to start growing. You must check the pH level before planting and adjust the acidity or alkalinity according to it. If you wish to have an active growth of the plant, monitoring the pH level is very important. If you feel your soil has more acid, you must add lime to increase its alkalinity, while on the other hand if you feel the soil has less acidity then add materials containing more acid. The device is very simple in use. You can quickly determine the acidity and alkalinity of your soil. There are no complications in doing so. The electronic pH testers are portable to use. You can take the device anywhere you want. These soil pH soil testers are very accurate, especially electronic testers. Only one or two readings will give you accurate results. If you are for using an electronic soil pH tester, then know that it will cost you a high price. Electronic soil pH testers are very costly to buy. The accuracy of a pH tester should be such that it must be able to give readings above and below the actual pH calculated from the soil. The soil pH meter can have 0.02 units above and below the actual pH of the soil. Calibration is carried out by using colored liquids with a known pH value. A good soil pH tester should be calibrated with at least two such liquids. This is a part of a pH tester which is supposed to be dipped in the soil solution. Before buying the product, you should know the cost of replacing the electrodes since it might get damaged with time. Instead of buying a new pH tester, you can replace its electrodes. All you have to do is to make up a soil solution. Get a sample of soil from your garden to mix it in water. Then, you can put your soil pH tester into the solution to get a reading as accurate as possible. If you receive a reading between 3.0 and 5.0, know that the soil has high amounts of acid in it. If you get a reading between 6.1 and 7.0, then your soil is moderate on acid. pH 7.1 till 8.0 will give you alkaline soil. This soil tester from Covery Company is best to use since it is not only made for pH testing. You can use it for other purposes as well, for example, moisture tester, light tester, etc. It only requires 10 minutes to get a reading. Customers are advised to use the Covery soil tester with cleanliness. You must wipe it clean before using it. Also, the probes must not touch any rock or any hard object otherwise you will be damaging it. Following these tips will give you the right readings. The tester can measure the moisture in the soil. This way you will know how much water you need to give to your soil. The tester can measure the amount of light it is getting. If it does not get enough light, you can change the place of your plant. It will help you in controlling the pH level of your soil. There are no batteries needed to operate the device. The device is suitable for indoor as well as outdoor plants. It is easy to use. Its readings are read easily. You will know how to maintain your plant in the best way possible. Some customers have complained about the product to give inaccurate results at times. You must not compromise on the accuracy of this product. Once again, this product is made for more than one use. Below, you will be told in detail on what this soil tester is capable of. Other than this, you can use this tester to keep your plants healthy and in the best state possible. Its usage is very easy where you only have to insert its probes into the soil. Only 10 minutes are required to receive a reading on its screen. It is said to take care of the probes as it is the most important part of the device which lets you determine the pH readings of the soil. You must keep it clean after use. You can measure the amount of light your soil is getting, whether it is high or low. You can adjust the place of your plant according to the reading you get. Soil’s moisture is also important to let your plant grow in a healthy way. MoonCity will help you through in determining the moisture of the soil. The pH level can be calculated by this device. Depending on the reading you get, you can add more acid or more alkali to maintain the pH level. To get the device to work, there is no need of a battery. The device does not operate through batteries. The device is suitable to be used for indoor and outdoor plants. The results are easily read on its screen. The product has received complaints regarding its accuracy. There are some customers who have received an accurate reading while others have complained about it. Its metal is very fragile to use. Customers claim that HealthyWiser soil test kit is an impressive package one could choose. After witnessing results, they have started recommending other people to use it too. The only thing required by the user is care. They must handle the device with care. The probes with which the device is supposed to calculate the pH level, lighting and water level are very sensitive. They require cleanliness before and after they are used. Look at its feature and decide for yourself. 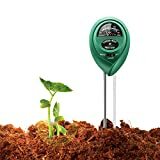 The product can calculate the pH level along with water and lighting of the soil. In this way, you can maintain your soil and plant in a healthier manner. There are no batteries needed to operate this device. It works well without any batteries. It can give readings faster than other testers. It is decent in your pocket. It is easy to carry around in garden located in different areas. It is good for both, indoor and outdoor use. A few people complain about the product to be inaccurate. No one compromises on the accuracy of a soil tester. If one does not wish to use an electronic pH soil tester, then this product could be their next choice. It has the traditional way to calculate the pH value of the soil through color charts. 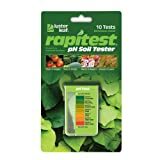 The Luster Leaf Soil tester can be used for 10 tests. There 10 capsules that can help you determine the pH value. The product consists of 10 capsules that determine the pH level of the soil. It provides you with a color chart through which you can calculate the level of pH in your soil. It comes with a set of instructions one needs to follow. There are tips and advice given for above 400 plants. The product is inexpensive to be bought. It does not have a high price. It will help you maintain the nutrients needed in the soil. One package can be used for about 2 to 3 years, as stated by customers. It does not work for light and water level. This product can be used for more than one purpose. Give this product a detailed review, so you will know the benefits and drawbacks of using this device. The product is efficient in calculating the pH value, moisture level and water level in the soil. There is no battery required to operate the device. It can be used on potted plants as well as gardens. The product is portable to use so you can use in various gardens. It is good to be used indoors and outdoors. It is easy to use by customers. The pH indicator does not give the right readings to the user. After reviewing the best pH soil testers, we can easily append which one is suitable to be used. 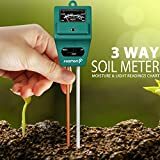 MoonCity 3 in 1 soil tester can be considered as a good choice since it benefits us with three readings all at once. The product has no difficulties while using. It is easy. The only drawback is of accuracy with all products mentioned above. Overall, using a soil pH tester will give you benefit because of it will give your plant a suitable condition to grow. Your plant will be healthier if you test soil’s pH before planting. Choose the best pH soil tester after reviewing its details.